Last weekend Peter The Outlaw Gardener and I went to the Bellevue Botanical Garden to shop for plants at the Northwest Perennial Alliance's March Mania Plant Sale. It started out a cold, wet day but for a short time just after we had finished our shopping, the sun came out and we decided to take a little walk around the garden. 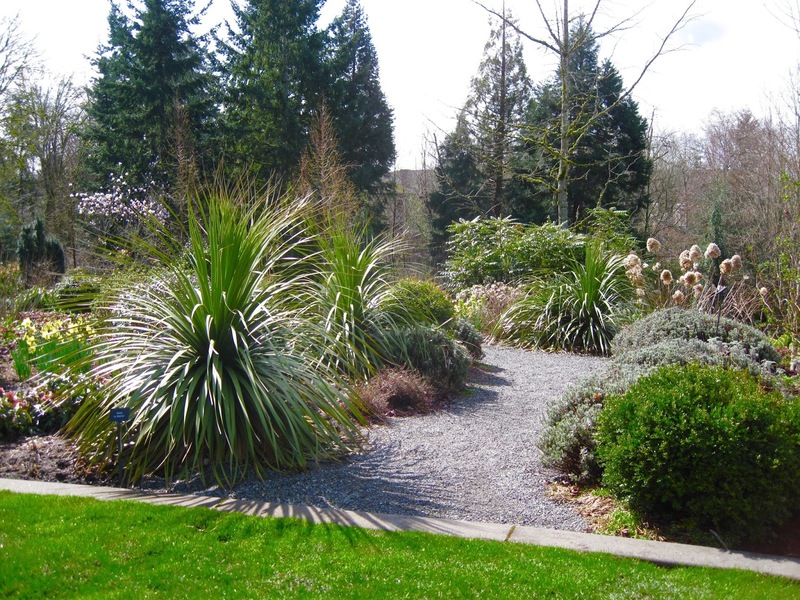 The NPA manages a very large border built into a slope at the BBG, an impressive display of shrubs, trees and perennials that work well here in the PNW. You can read about it here. I'm sure any bloggers who attended the Seattle Fling will remember it well. I don't remember seeing it this early in the growing season, and hadn't realized it looked so good in the late winter/early spring. I was impressed with the swaths of Hellebores growing there, but what really impressed me and Peter both was this set of three Nolina 'La Siberica.' I've seen them before, but I don't think Peter had. He exclaimed quite loudly when they first came into view. I'll be sharing more photos from that day in future Wednesday Vignette posts. Anna at Flutter and Hum hosts Wednesday Vignette. You can see her current post here. This post makes a great Foliage Followup too, hosted by Pam at Digging. Her current post is here. I had the same reaction as Peter, just through your photos! Wow - major plant lust.... now where might one find one of those...? Just beautiful, Alison! They are beautiful! It was such fun spending time with you again at the BBG! I might need one of those for the front yard. Very cool. They're great looking plants, especially when featured in an expansive space like that one. I visited this garden with friends a few years ago-we were impressed and because we had a hot date with the ferry could not stay as long as we would have liked.I hope to return in the not too distant future. The NPA border at the BBG is really coming along nicely after being redone I guess about five years ago? I always enjoy my visits there. Late winter/early spring is a special time with bulbs in bloom, all of the hellebores, and wonderful things emerging from the soil. Fantastic architectural plant, it is stunning! The only time I managed to get there, they were in the middle of the redo. I look forward to seeing it through your lens. My three Nolina 'La Siberica' are finally getting some size on them. I am both thrilled and a little worried. 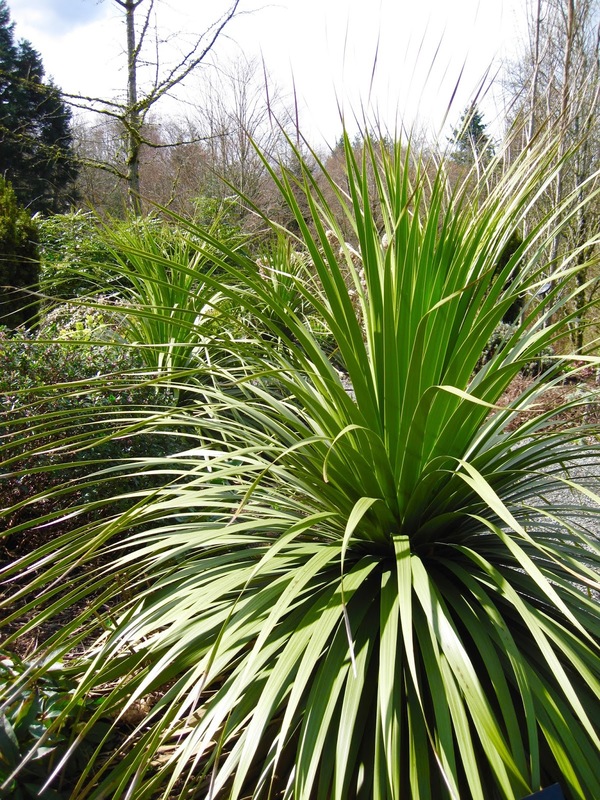 I'm considering a few of these for sunnier spots in my open oak woodland-to-be, along with Yucca rostrata 'Sapphire Skies' and plain old Yucca filamentosa. Love the shape!